Set in the remarkable beauty of the North Wessex Downs, Sandford Springs Hotel & Golf Club is one of the top golf resorts in the South of England. The marriage of 4* luxury accommodation and 27-holes of championship golf provide all you need for the perfect golf escape, all just an hour from London. Sandford Springs Golf Club is nestled amongst the rolling hills of Berkshire and Hampshire, boasting three unique loops of nine holes, you can play this course in a variety of ways. As well as the Park, Woods and Lake circuits, the golf club has a superb driving range, pro-shop and excellent clubhouse restaurant. 1 in 16 go free November to March and May to September! 1 in 12 go free in April and October! 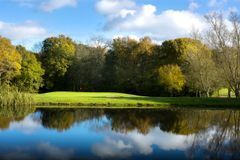 Sandford Springs Golf Club makes great use of its enviable location to offer a trio of superb 9-hole courses – The Park, The Wood and The Lakes – all are distinctly different and provide great enjoyment. Located between Basingstoke and Newbury, the course was laid out by Hawtree & Son (founder members of the British Institute of Golf Course Architects). The original 18-hole were officially opened by Sir Nick Faldo and Bernard Gallagher OBE in 1989, the final 9-holes were finished in the summer of 1991. The signature hole is the 9th hole on The Park Course – a short downhill par-4 which requires an accurate long iron from the tee followed by a good approach to a putting surface which is guarded by two lakes. However it is possible for the long hitters to carry the 270 yards over water! This was an absolute pleasure, beautifully appointed rooms, clean& tidy with a fantastic bed and shower room. We all slept very well here. The food was great, service good and value for money. Drinks were reasonably priced too. The sympathetic new architecture perfectly compliments the existing old clock house building creating a great vista. The overall feeling was very relaxing. This was my fourth visit to Sandford Springs,this time with a party of forty. I was very nervous of keeping that many happy. Not a problem. No one could fine ant faults to speak of. Food,rooms,staff were all rated very highly. The courses,3x9holes, were also highly recommended by both low and high handicappers. One gentlemen said he go as far as to say it was his most enjoyable holiday ever! Apart from the weather on the final day, which is obviously out of everyone's control, our trip to Sanford Springs was a great success. Our group consists of a wide range of handicaps, from single figures to mid twenties, but all were catered for with three 9 hole loops, each with different characteristics. The condition of all three courses was excellent, with undulating fairways and greens to test any level of golfer. The staff throughout the complex were very welcoming and helpful, providing polite and quality service during our stay. The hotel was exceptionally clean and the rooms were very well equipped. The food was excellent too, with a varied choice for both the evening meal and the breakfast. Overall the consensus of the whole group was that this is a great venue and one we would all happily return to at some point in the future. Finally, I would like to thank you and YGT for the professional approach to helping people like myself in organising golf trips for groups of varying abilities and making the experience as easy as possible. We had a really good time at Sandford Springs – The 3x 9 hole golf courses were all interesting and in good condition; the greens in particular were excellent. We also used the halfway hut which was excellent. The hotel, which has only been open since October last year, has beautiful modern bedrooms and members of staff were very friendly and helpful. A slight downside – we were the only 4 in the restaurant the first night – is that the menu was a bit limited and after the meal there was no lounge/bar area for us to sit and have a coffee/drink, which was a shame. This meant we either went to the golf clubhouse which was a short walk outside (and closed 10.30 ish) or went to our room. Fantastic! All aspects of the golf, venue, services were as advertised / available to consider from on-line info (not always the case). In terms of the golf, the Woods course is the best of the 9 holes. It's challenging, very pretty, and it helps to play it twice 'cos a fair few of the holes feature blind drives. The Park course has the best closing hole of all though, as well as a very good opening hole and a lovely par 3. They all hold up very well even with significant rain so they must have a great drainage system. The hotel, clubhouse and Pro Shop service were all first rate too. In good weather we would have given this a 5 but due to the hot summer many fairways were pretty rough with burnt grass/no grass. We arrived after 2 days of torrential rain including our 1st day. However the pro-shop staff were very accommodating and managed to put our Tee time forward so It was not pouring down by the later time. No buggies day 1 but by day 2 the course had drained well. A great combination of 3 x 9 hole layouts, our favourite was the "Woods" followed by the "Parks" courses. But play all 3 if you have time. Overall a great find and we've unanbimously voted to return next year! Both low and high handicappers enjoyed this course. Not the easiest but a wide variation of holes.